Ready to see Inaction in action? On Saturday, Dec. 20, 2008, Julia Rock, founder of Inaction Is Not An Option, will be a guest speaker at "The Face of AIDS" event at the St. Marks Methodist Church in Harlem, NY. The event will be hosted by MMHighlights, a rising society & entertainment blog anchored by an exceptional avant-garde of young marketers whose expertise lie in integrated marketing communications. The purpose of the event is to help commemorate December as AIDS Awareness Month by providing information, literature, and entertainment to members of the Harlem community. 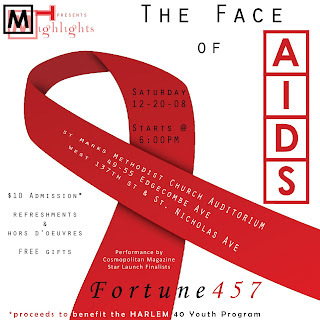 The proceeds from "The Face of AIDS" event will be given to the Harlem 40 Youth program, which aids in helping Harlem youth strive for better futures through educational, professional, and social development initiatives. Click the image below for further details. For further details, please contact mmhighlights@gmail.com. Even if you are unable to make it, please share this event with someone else. We want to spread awareness and education faster than the infection. Knowledge saves lives, so pass this on! A Message From Our Founder: HAPPY NEW YEAR!